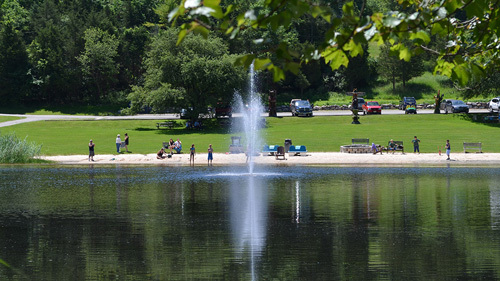 Detrick is a Canal Society member who also chairs the Warren County Morris Canal Committee, a group under the Warren County Planning Department that has been working on that county's long-range plan to acquire, preserve and develop recreational facilities at sections of the canal. According to Detrick, visitors to Waterloo can walk across a replica of the mule bridge that traversed the Musconetcong River to the foot of Inclined Plane 4 West. The sleepers that held the plane's rails, the foundation of the powerhouse and plane tender's house, and a length of the plane's cable all are visible in this area. Waterloo also has the distinction of being the spot where three years ago, the Canal Society put a boat on a watered section of canal and used mules to tow it. This marked the first time in some 74 years that mule and boat were reunited for a trip on part of the Morris Canal. Waterloo Village also is the location for the Canal Society's annual Canal Day, held each year in late spring. Continuing to the west are further sections of the Morris Canal Greenway trail, leading to a largely abandoned hamlet that was known by names that included Byram, Stourport and Starport. There are sections of towpath cleared here along the canal, which frequently contains water. Remnants of those bygone days include ruins of buildings, a stone abutment for a bridge that crossed the canal, and stonework that supported the canal embankment. Another section of the greenway trail is accessible from Kinney Road, off Waterloo Road and near Waterloo Village's large concert field. Visible here is a waste gate that allowed water from a stream entering one side of the canal to discharge out the other side. The gate also could be used to completely drain that section of canal for repairs. Proceed west for about a half-mile as the canal skirts the concert field, offering scenic views of the Musconetcong River. The trail runs along Waterloo Road for a short distance and then to another historic industrial area, where a stream flowing from Deer Park Pond once powered a sawmill. Ruins of the sawmill remain, as does a lime kiln next to it. Morrell says an iron ore dock on the canal also existed in this area. 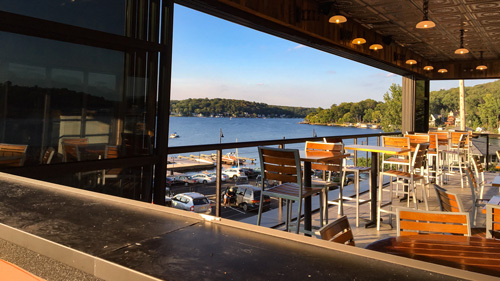 Nearby is the site of Lock 4 West, and the lock tender's house, now owned by the state, was once known as Elsie's Tavern. Morrell said the Canal Society is hoping to get this building restored. 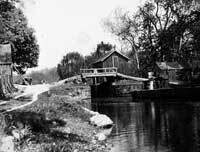 Historic view of lock at Saxton Falls. A tour of this section of the Morris Canal ends at Saxton Falls, where a dam was constructed so that the Musconetcong River could be used as a slack water navigation section of the canal. According to Morrell, the Saxton Falls area was at one time known as "Little Phillipsburg,'' because so many people from Phillipsburg had bungalows there. The bungalow community existed until about 15 years ago, but many of those properties were purchased by the state for a reservoir that was never built. Through the greenway project, "We're really opening up that area to people again,'' Morrell remarked. Saxton Falls includes another lock that has been filled, but the top of its stone walls is visible, again giving the visitor a sense for the size of a Morris Canal lock. Morrell said the Canal Society would like to see a boat ride along Saxton Lake someday. Also at Saxton Falls is a commemorative plaque regarding the canal, and a cleared section of towpath stretching more than a half-mile. 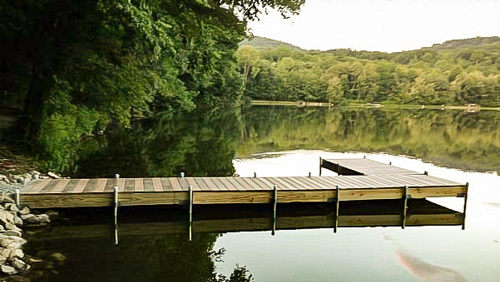 Private campground community offering affordable vacations that include central water and sewage disposal, boating, hiking,fishing and planned activities throughout the summer for all ages. 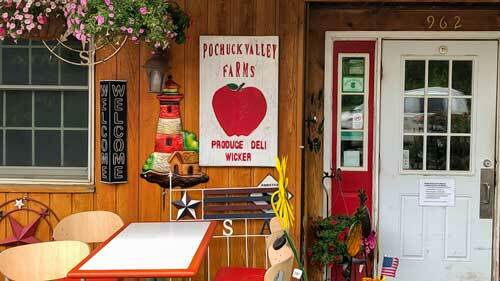 Located minutes from Mountain Creek and only 55 minutes from New York.